Glory Be! Roots music to gladden the soul, heart and mind. I’ve been a fan of Jeremy Lindsay aka JT Nero’s quirky and intelligent music ever since I saw him in the 1pm slot at a festival several years ago. When he was joined by the delectable Allison Russell from Po’ Girl for a UK Tour in 2011 to promote his Mountains/Forests album that she had sung on, I was astounded by the sweet sound their voices made when singing together. 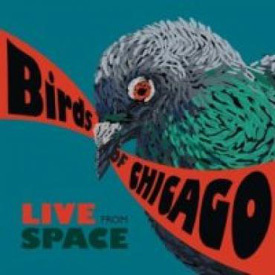 Their debut self-titled album was every bit as gorgeous and sweet as I’d hoped it would be, and this Live from Space (Evanston, Illinois actually) sounds even better; which is perhaps down to the acoustics as much as it is to the edge that the adrenalin brought on by a live performance brings to their voices. The album opens with Allison giving a gospel-ish performance of “Barley”, her crystal clear voice only complemented by hand-claps and a kick-drum, but still creating a joyous noise that would have made Nina Simone proud. With only a single album to their name, JT and Ali go through Lindsay’s back catalogue and breathe fresh air (if such a thing is possible) into “Mountains/Forests” and “(I Have Heard) Words”, which is so good most of their contemporaries would have to keep it as an encore. I loved the original, but here you sense that the duo are singing at each other and totally forgetting that there is an audience in the vicinity. On paper, I shouldn’t like Sans Souci, but this Cajun song, sung in French, was a highlight of the night I saw the band and stands out here too. It truly showcases Alli’s vocal range and Drew Lindsay’s swinging accordion playing. The album ends all too quickly with JT passionately delivering “Trampoline” as if his life depended on it. And, finally, “‘Til it’s Gone” starts with Allison sounding like a smoky torch singer over a soft jazzy piano and drum accompaniment, before she gives a virtuoso clarinet solo and JT joins on harmonies not heard since the halcyon days of Gram and Emmylou. If I have one gripe about this delightful album, and it’s a small one, it is this: If it is a live recording and promoted as such, why fade out the applause and the between-song banter? JT and Alli aren’t Crosby and Hope but I know from experience that they chat and flirt onstage. That said, the album is eminently listenable over and over again, in the way many live albums aren’t.